Last May 3, the result of bar exams held at the University of Sto. Tomas last November were released. Out of 6,605 examiners, 1,731 passed the exams. It’s an increased of 26.21% and was reported the highest since 2011. The bar topnotcher was 25- year old Rachel Angeli Miranda who came from the University of the Philippines- Diliman. 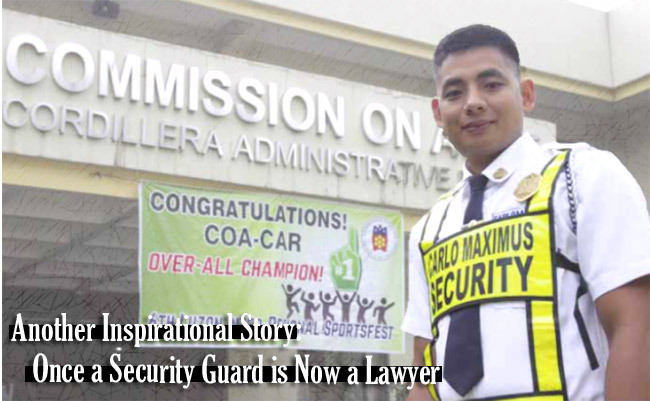 Aside from her, one of the inspiring story was a security guard from the province of Benguet. He is Roy Lawagan. He works at the Commission on Audit- Cordillera for 2 years. When he learned that he passed the bar exam last Tuesday, he celebrated it with his family. This was his second take and fortunately he passed this time. He first took a criminology course at University of Baguio then he went to St. Louis University to take a law course. On Roy’s interview with TV Patrol-Baguio, he revealed that instead of going to review centers, he was just self reviewing during his duty at COA’s Library and all his hard work paid off now. His co-workers were very proud of him and they call him now “Atty. Sekyu”. Roy also admitted he just took Law to pursue his dad’s dream for him to be a lawyer but eventually he enjoyed it. His inspiration was his family for them to have a better life. His wife was also interviewed and she revealed that she was shocked but happy at the same time. Roy said that he doesn’t have plans for now but him passing the bar exam is an advance birthday gift for him cause he is going to celebrate his 27th birthday on May 11. He also revealed that he will just work at COA until May 15 and will take the offer of his cousin to work at a law firm in Manila. He is 4th of the 9 children and some of his siblings had a degree in political science.